January 8th, 2019 - Does My Bomb Look Big In This? 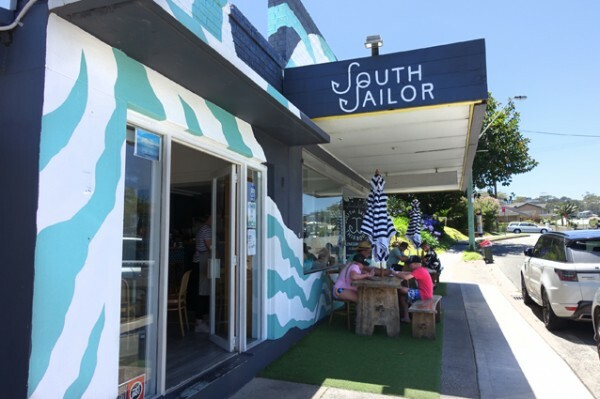 You’ll find South Sailor on Lawrence Hargrave Drive just a block back from the golden sands of Thirroul beach. 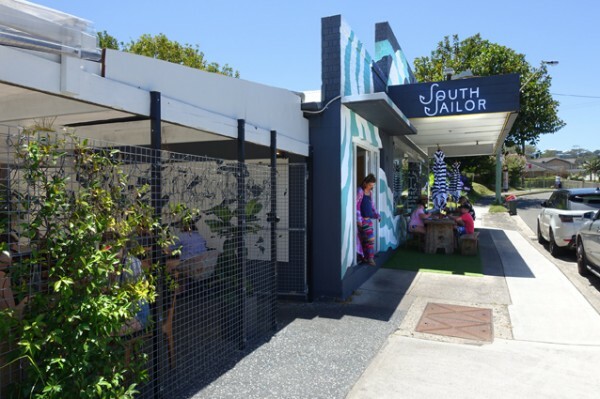 With a super-popular outdoor dining area and curbside tables under nautical striped navy and white umbrellas sitting on an AstroTurf lawn, it’s aimed directly at the sandy-feet crowd. Everyone is sporting a tan; and swim suit tops, singlets, hats and sunglasses seem to be an unofficial dress code. Inside there’s a small interior dining space filled with blonde wood tables and rattan chairs. 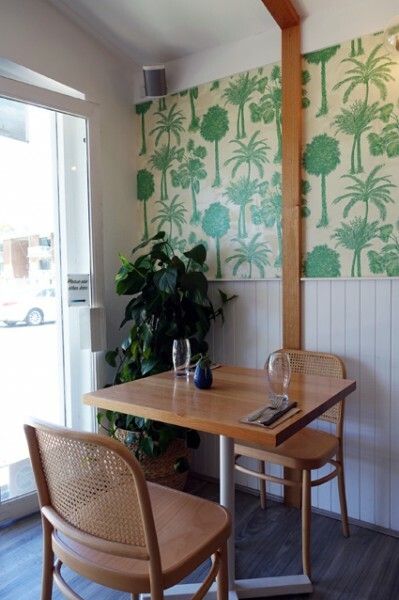 The white paling walls are highlighted with vintage palm tree wallpaper. 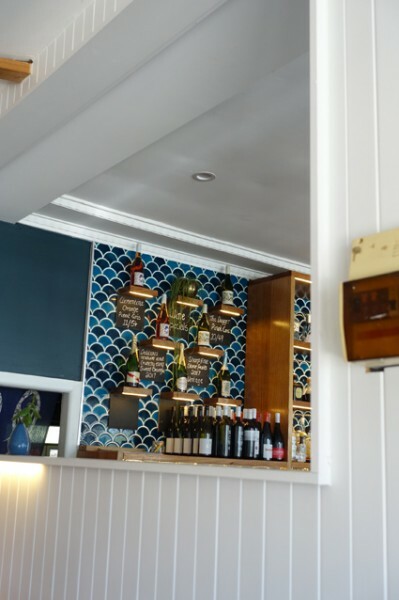 It opens out into a larger room where window tables are backed by a limited amount of bar seating in front of a tiny bar lined with fish-scale tiles in alternating shades of blue. With them running very close to their hundred people capacity during the busy lunch service when I visited, I was glad to see them turning away folks just looking for takeaway fish and chips. Gin is heavily featured on the beverage list, with an eye-catching Sunset Sour ($17) made on Husk Farm Distillery’s Ink Gin. 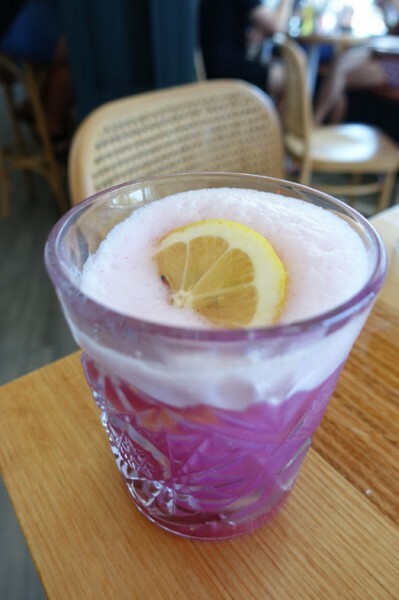 Coloured with the Thai butterfly pea flower, this mauve cocktail sees it teamed with blueberry, lemon, and an egg white foam that’s guaranteed to get the taste of salt off your lips. 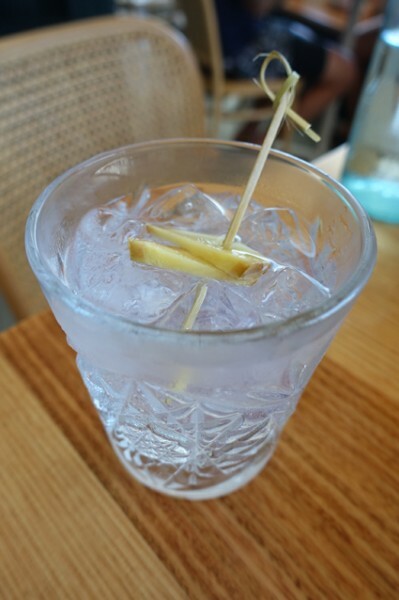 You’ll also find a gin+tonic list with some clever matches, like Japanese Raku Gin with Fevertree Indian Tonic and ginger, in a quaffable mixed drink called Made in Japan ($14). 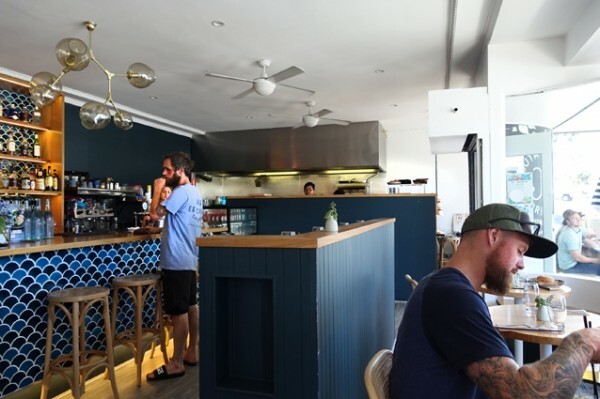 With two taps, and a range of craft brews, you can also indulge in an ice-cold beer to whet your lips after a surf or paddle. 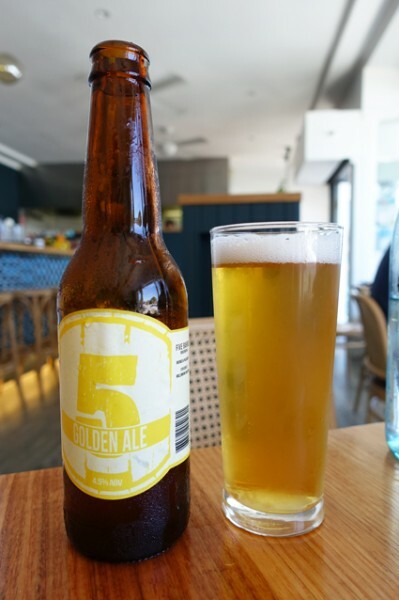 We stayed local with Wollongong’s Five Barrel Brewing’s Golden Ale ($8.50) that drinks a bit like Young Henry’s Newtowner, just with slightly more hoppy bitterness. Hoping for a bit of a menu overview, we hit up the Seafood Share for Two ($68). 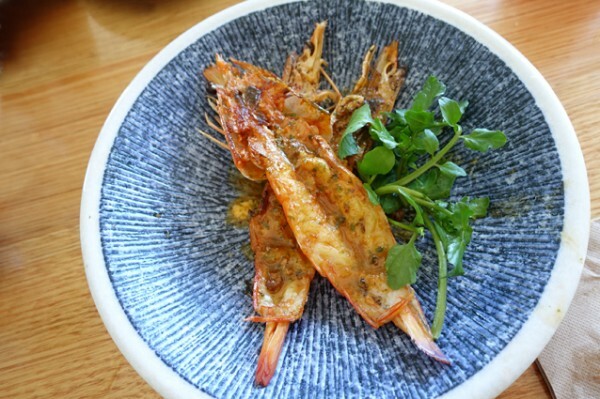 Delivered in two waves, it kicks off with cold dishes before heating things up with buttery grilled prawns served on the shell against skin-on chips and a perky little side salad. 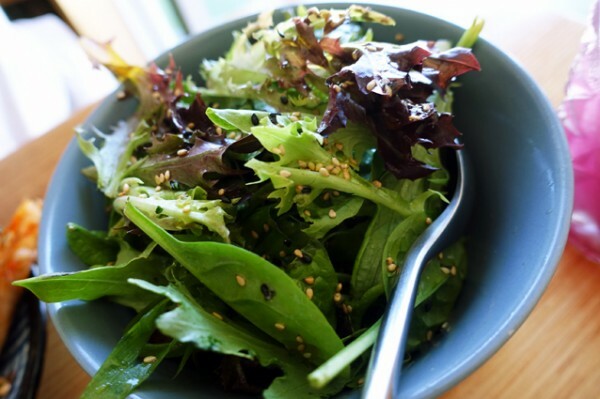 The salad is dressed with sesame seeds and yuzu (a Japanese citrus), with hidden pockets of seaweed, and is pretty indicative of the kitchen’s Japalian (Japanese-Australian) brief. 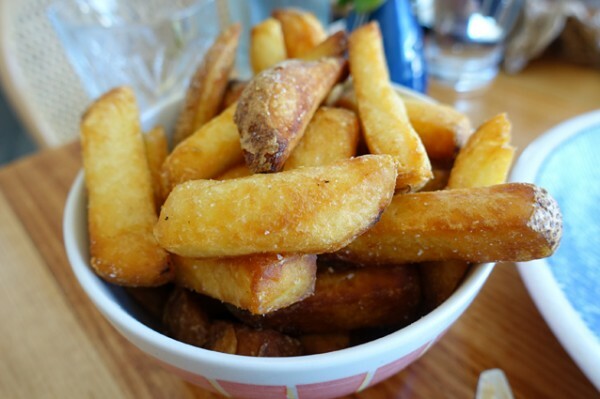 Do ask for some of their fluffy, garlicky aioli to make the most of the hand-cut chips. 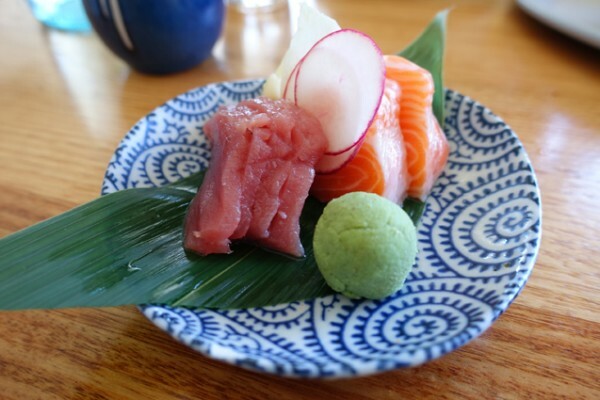 The sharing menu – which blossoms into a bottomless two-hour boozy offering on Saturday and Sunday lunch for $69/person – starts off with sashimi. 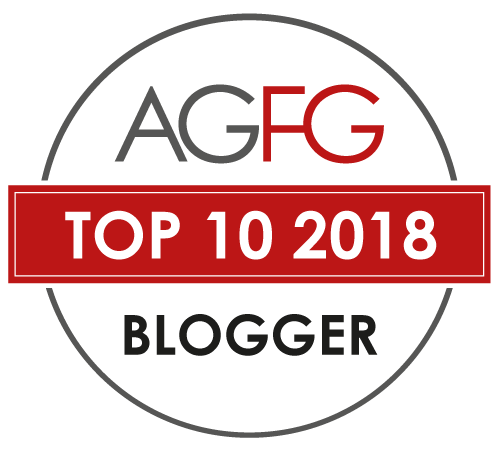 Thick wedges of salmon and thinner slices of raw tuna speak to the quality of their seafood, though perhaps would benefit from the use of a sharper knife. 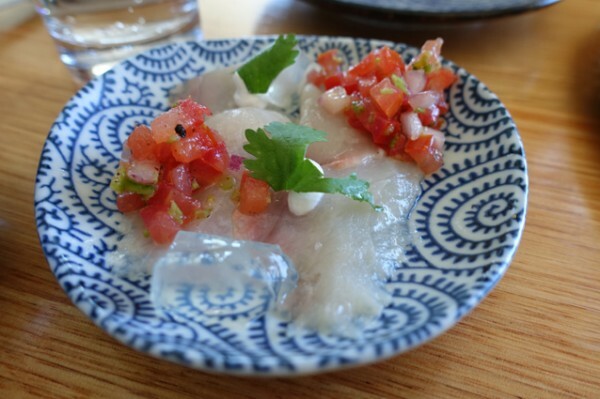 South Sailor's island ceviche sees translucent slices of kingfish given an almost Mexican treatment with tiny dots of cream, chilli, tomato and lime against slippery cubes of young coconut jelly. Crunchy cold fish tacos are the winners from our next trio of entrées, presented somewhat haphazardly on the same plate. 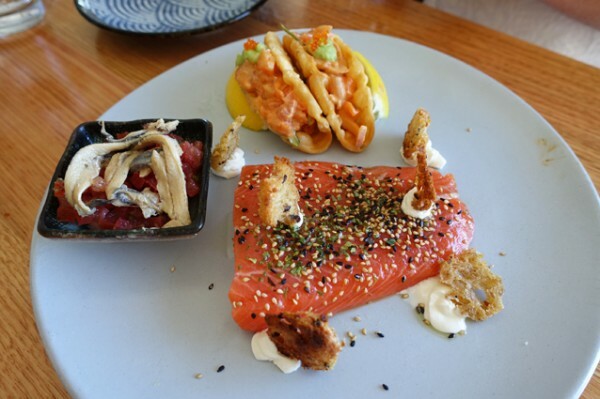 They’re perched beside a seed-scattered fillet of ocean trout pastrami that’s delicately handled and accompanied by dabs of smoked labneh adorned with tiny crisp sails. There’s also a little bowl of white anchovies sitting on a tomato salsa that are meant to be eaten on the accompanying super-crisp toast. While it’s not quite as grand as a seafood platter, I reckon this menu gives you a pretty good deal for your thirty-odd bucks apiece. 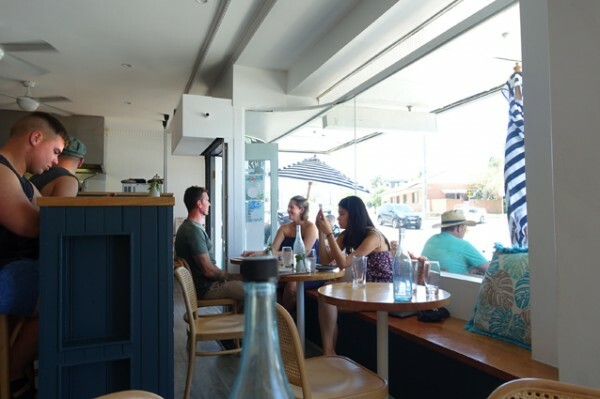 Lunch at South Sailor makes for a pretty satisfying end to a morning at the beach.